Add the steak to a large gallon size zip top bag. Add the olive oil, orange juice, lime juice, Mexican beer or tequila, cilantro and Old El Paso™ taco seasoning. Seal the bag and shake it well to combine everything. Make sure the marinade is evenly coating the steak. Place in the fridge for 4 hours or overnight. When ready to serve, bake the fries according to package directions. Meanwhile heat the grill to medium high heat. Grill the steak for 8-10 minutes per side or until cooked through and easily shredded. Remove the steak and allow to rest 5 minutes, then slice against the grain into thin strips. Divide hot, baked fries among 6 plates or dishes. Top with steak, cheese, guacamole, salsa (or pico de gallo), queso blanco and cajita. Serve immediately. So hearty, we won't judge if you eat these for dinner. See, I want to put fries in, on, or with everything I make. I have put them on burgers, salads and tacos. I’ve even topped them with Mexican pork and cheese sauce. So yeah, I have a little obsession with fries, but can you blame me? I mean, who in their right mind doesn't like fries? I love making homemade oven fries, but when things get crazy and life gets too busy for cutting potatoes into thin sticks, I head for the frozen ones. For these fries, I wanted to keep things quick, easy and just plain simple. It’s summertime, and that means that spending hours in the kitchen is a big fat NO. 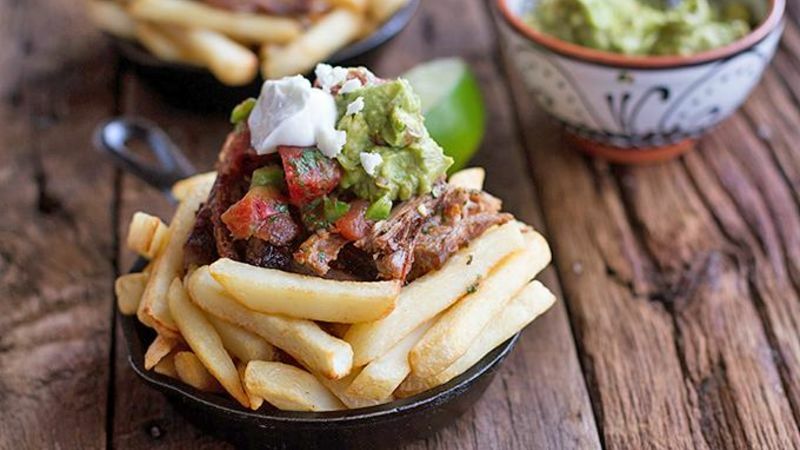 So not only are these fries crazy easy, they're crazy good. That’s a real winner in my book! This marinade practically makes itself when you use Old El Paso seasoning to kick it into gear. Add everything to a bag and give it a really good shake. Make sure the marinade coats all of the steak. Then place the steak in the fridge and let it marinate at least four hours. When ready to eat, bake the Cascadian Farm French fries. I like these straight cut ones for this dish. Grill the steak and slice it. Divide the fries among 6 serving dishes. Go ahead, pile on all the good stuff – steak, guacamole, cheese, salsa and queso blanco or sour cream.